The Waypoint Robotics team sits with their autonomous mobile robots at their Merrimack facility. From left to right: John Curtin|! !| Andy Mertinooke|! !| CEO Jason Walker|! !| Vice President of Business Development Mike Morin|! !| Nick Varas and Trent Brick|! !| with their feet on the Waypoint FlexOmni V3 and Waypoint 440LE V3|! !| and five Waypoint Vectors in the front row. Automating a production line has traditionally not been an easy process. Waypoint, a spinoff from Stanley Elevator Company, aims to make the process easier with its Vector, an industrial-strength, omnidirectional, fully autonomous mobile robot. The Vector delivers products and materials to set delivery points, such as the shipping department. In fact, the Vector’s control features big buttons reminiscent of an elevator’s. To program it, users simply drive the robot to the loading dock or component storage room and assign a button to the destination. After the Vector has been programmed, it will run on an automated schedule or receive instructions as needed. Walker thinks Waypoint’s approach to robotics could resolve a common manufacturing issue: the skills gap among workers. Ease of use is a common concern for companies considering incorporating automation into their plants, and that is not made any easier by the fact that robots speak different coding languages. IPSUMM, a manufacturing-focused product development company with a facility at Pease International Tradeport, launched a solution to this problem in 2015. Called IRIS, it’s an interface that works “with any robot platform so you can teach the robot the same way,” said President John Kodzis. The IRIS System, a flexible, six-axis robot work cell, can be incorporated as part of a conveyor feed system or work beside employees. The work cells can be plugged in and out, and the control pad features buttons to move the robot up and down. Kodzis agrees that robots have traditionally been unnecessarily complicated for those without an engineering background. IPSUMM has been testing the technology in Indonesia, where the intuitiveness of the robots has proven out, he said. Both IPSUMM and Waypoint consider their market to be small- and medium-sized manufacturers (though IPSUMM works with some large corporations). Kodzis said smaller manufacturers are more hesitant to adopt automation. 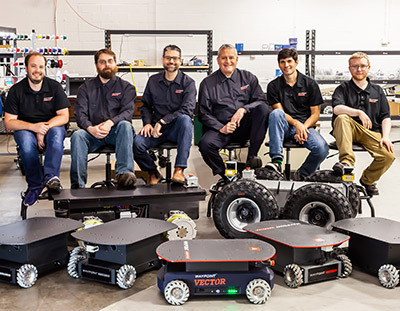 Jason Walker, CEO and co-founder of Waypoint Robotics, thinks the Vector can transform how manufacturers utilize automation and embolden employees to work with robots. “It’s definitely a mentality shift. It’s a whole culture change. The mentality of a manual process — feeling you have to do things because it’s tribal knowledge — is hard to shake,” he said. Manufacturers have to be open to change, considering what processes are logical and reasonable to automate. “When you see manufacturing around the world, it’s done very differently,” said Kodzis, who has spent a lot of time in Asia observing workers working side by side with robots. While in general, manufacturing is becoming more automated, much of the market’s growth will take place in the pharmaceutical, biotechnology and the food industries, said Kodzis, which is why New Hampshire’s robotics and automation companies tend to be located in the southern tier of the state, close to their Massachusetts customers. “Efficiency is definitely a driving factor, but when you talk about efficiency, it also has to be a good return on investment,” said Kodzis. Newer companies will tend to try bits of automation, whereas more established brands may have a harder time because it’s an incremental step, he said. Waypoint has sold 20 Vector robots since the second quarter of 2017, as well as a lot of ecosystem accessory products, said Walker. Considering the Vector didn’t exist four years ago, Walker is optimistic about its adoption. He said it’s less of a financial risk for manufacturers since it doesn’t require tearing down and rebuilding their operations. Being a subsidiary of Stanley Elevator in Merrimack, Waypoint is a unique startup since it has access to seed funding. While Waypoint may not need the financial assistance most startups seek, Walker was interested in participating in Accelerate NH, Alpha Loft’s 14-week startup program, for other reasons.